This is a simple utility which allows you to customize the toolbar of Windows (any version) in different ways. It has a clean and intuitive interface with all the features available within reach. 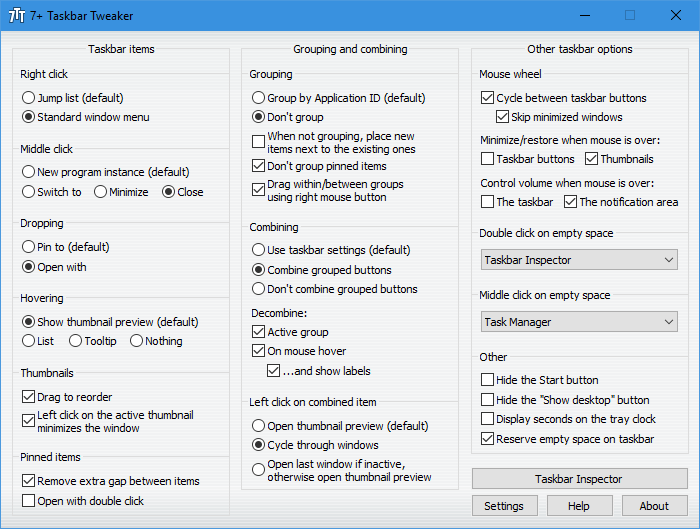 The tool gives you an option to either turn off the feature that groups items on Windows taskbar or the one for pinned items. It allows you to create new shortcuts from the clicking. For example, if you double-click or middle-click on an empty space in the taskbar, you will be transferred to the desktop or display the Ctrl+Alt+Tab screen, launch Task Manager, turn your speakers on and off, and so on. You can also create a new program instance, set focus to that application, minimize or close it by changing the middle-click action, use the standard window menu such as Restore, Move, Size and Minimise in place of the jump lists. Though this application is not hard to operate, it doesn’t come with an help manual to guide beginners, which can be a problem if they come across a complicated feature. 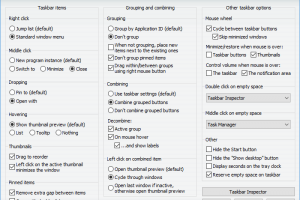 Overall, this application is a great tool for tweaking your Windows to your liking, especially your taskbar functions. 7+ Taskbar Tweaker is licensed as freeware for PC or laptop with Windows 32 bit and 64 bit operating system. It is in system tweak category and is available to all software users as a free download.